Penewen is an Altmer mage and advisor to the Aldmeri Dominion located in the Brass Fortress's tavern, The Cloisters. "I didn't travel all the way to this mechanical bemusement simply to see the sights. I have a mission to perform. If you'll excuse me, I'm much too busy to talk to you." "So many mysteries, all revealing themselves at the same time. Coincidence? I think not!" "Sotha Sil once sojourned among the adepts of the Psijic Order. I hope to find some link between this mechanical monstrosity and the island of Psijic monks. I'm certain there's a connection!" She is actually High Magistrate Rinwaray of The Divine Prosecution (posing under the identity of Penewen with an enchanted necklace). 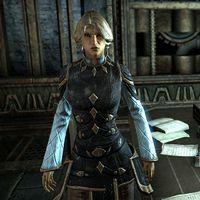 She manipulated Telenger the Artificer to use his teleportation device, the Hyperagonal Locational Determinator, to teleport her into the Clockwork City. There she planned to find Seht's Affect Inducer, A magical device entrusted originally to Barilzar that can manipulate a person's emotions. She planned to use it on Proxy Queen Alwinarwe for her own political gain and to revert the Summerset Isles to isolationism. Her efforts were stopped when Razum-dar caught wind of her plot and followed her tracks through the Clockwork City, the Evergloam, Artaeum (accidently) and eventually caught her in Alinor where he managed to subdue her and now awaits the Queen's judgement.